Oscars 2012: Leo, Charlize, and Tilda should be competing too. Why expand best picture? It’s the acting categories that need more names. Still from The Descendants © 2011 Fox Searchlight;The Artist © 2011 the Weinstein Company; J. Edgar © 2011 Warner Bros.; Drive © 2011 FilmDistrict. All rights reserved. Of course not. Most people don’t watch the Oscars because a certain movie has been nominated, the occasional megahit like Titanic or Lord of the Rings aside. They watch for the actors—how they dress, how they take a joke from Billy Crystal, how they feign graciousness when they lose. So if the academy wants to expand something, why not blow out the acting categories? 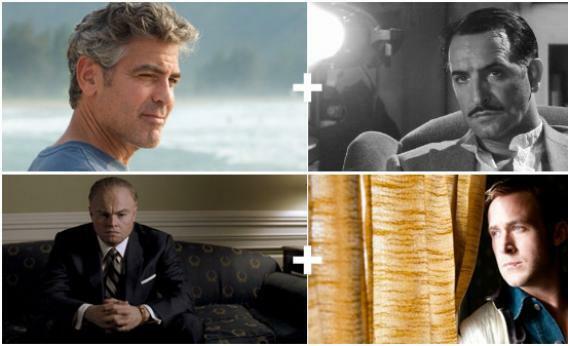 Expanding each one from five to 10 nominees would add 20 stars to the Oscar-night mix. This year, such an expansion would likely have meant the participation of Tilda Swinton, Kirsten Dunst, Charlize Theron, Leonard DiCaprio, Ryan Gosling, Albert Brooks, Vanessa Redgrave, and Carey Mulligan. And unlike in best picture, where a lack of support in other categories can peg a nominee as the longest of long shots, no such requirement exists in acting categories—performers win Oscars for otherwise little-nominated movies all the time. (Most recently: Jeff Bridges for Crazy Heart, Heath Ledger for The Dark Knight, Marion Cotillard for La Vie en Rose.) A 10-person best actress category would be an enormous, entertaining mess, with no one sure who might come away with the award—but with twice as many stars crossing their fingers on Oscar night.